FILE - Canadian and Greek flags hang above memorial wreaths at Alexander the Great Parkette, the scene of a mass shooting on Danforth Avenue in Toronto, Ontario, Canada, July 24, 2018. Canada's federal government introduced gun laws earlier this year that would require retailer record-keeping and beef up background checks. The government is open to considering tougher o nes after Toronto called for a ban on handguns in the wake of the Danforth shooting, said Bill Blair, the minister charged with tackling gun violence. 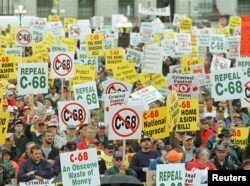 FILE - About 9,000 gun-owners, upset about the Liberals' attempt to create a national registry of all gun owners and their arms, rally on Parliament Hill to protest the Federal Government's tough new gun law, C-68, in Ottawa, Ontario, Canada, Sept. 22, 1998. The Liberals criticized the former Conservative government's 2012 move to scrap a registry of shotguns and rifles but the issue became so politically t oxic that the party has promised not to bring it back.